Inspired By True Events - Shakespeare: The most easily summed up playwright? Shakespeare: The most easily summed up playwright? 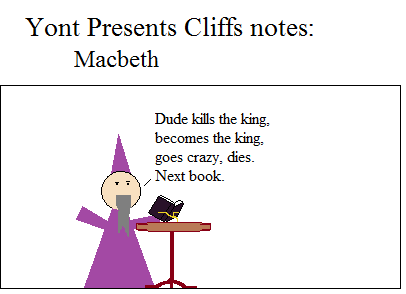 I actually don’t hate Macbeth. The characters seem to change roles for no particular reason, but it is exciting, when it’s not long winded. Whoa. Didn’t intend for that to become an actual review. It’s not that kind of blog. Here, let me distract you with other Yont Presents Cliff’s Notes. Yeah, that oughta hold you.